It’s only August but at Christmas Elves we’ve already been working away for months to create a new and exciting store. As soon as we return from the international trade fairs our ideas start to take shape. Work begins on formulating our creative themes based on popular trends and colours. It’s my job to bring the best new ideas in decorating and visual merchandising to our Australian store. 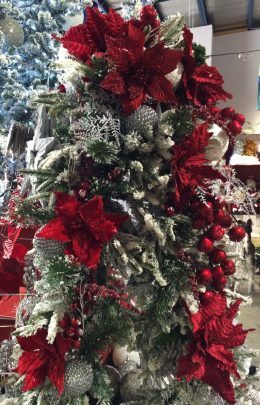 All our themed Christmas trees are placed on podiums and have an accompanying “A” frame showing key decorations. The “A” frame is a wire stand designed to display product. 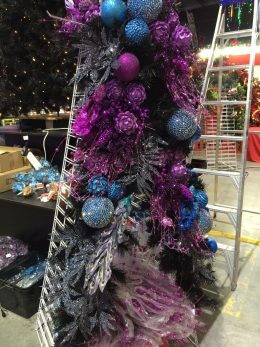 I cover the edge of the frame with garland to provide a base for the decoration on top. 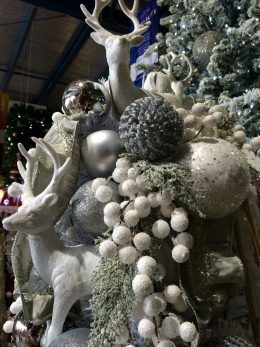 The extra decorating space can showcase an alternative colour scheme and provides creative inspiration for the customers. 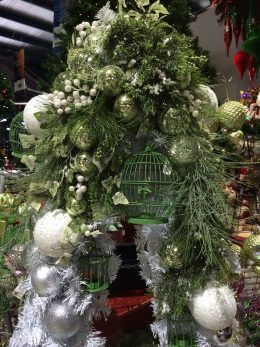 Larger display pieces can be added to the garland like these birdcages (above) or the reindeer and angels (below). I use floristry wire to secure larger pieces. This idea can be used to frame a mirror, mantlepiece or bookcase in fact anything with a hard edge will look better covered and decorated in this way. Lighting can transform your look these purple copper wire lights are easy to use and very effective. Everything is beautiful ! Can we see the full trees?? Thank you so much. I’m still working on the trees but will be posting on each theme when complete.